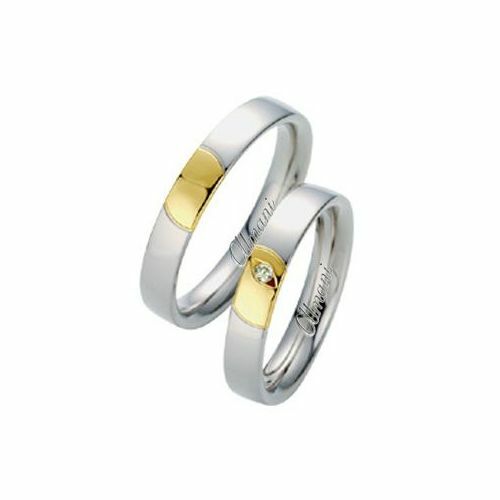 This 14k Gold .02ct His & Hers Wedding Rings Set is 4mm wide and approximately 2mm thick. The bands are rounded on the inside, creating a comfort fit for constant wear that will not pinch and still slide easily on and off of the finger. 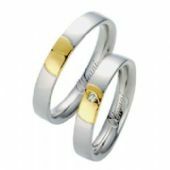 These beautiful hand made designer wedding bands are crafted in a low dome shape in 14k white gold. The bands contain a yellow gold splatter design. HER band features one small round brilliant diamond placed along the yellow gold portion of the ring in a diamond cut eyelet, adding elegance to this beautiful set.